Free shipping to United States when you buy 3 items from VinylosityCo. See item details below for sale terms. Black will not show on dark surfaces or car windows. 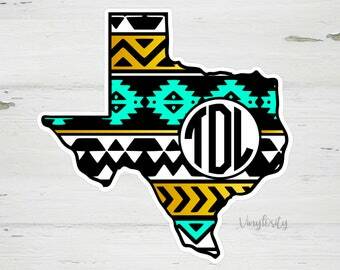 If no colors are selected, your decal will come as shown. 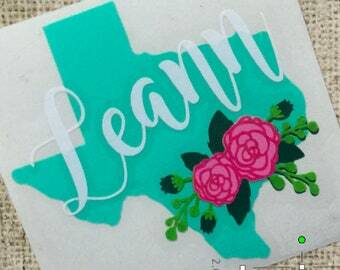 This listing is for one Personalized Floral Texas Vinyl Decal. - Select the SIZE you'd like in the drop down menu. - Select the QUANTITY and ADD TO CART. 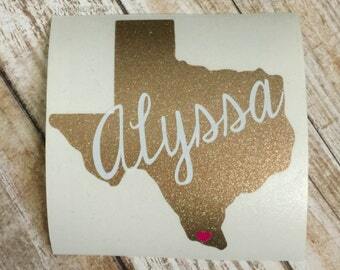 - Include your NAME & COLOR OPTIONS in the 'Note to VinylosityCo' comment section at checkout. 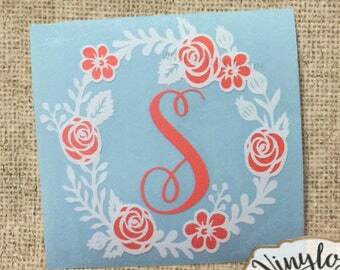 Your name and monogram will be done in the order in which it is received. 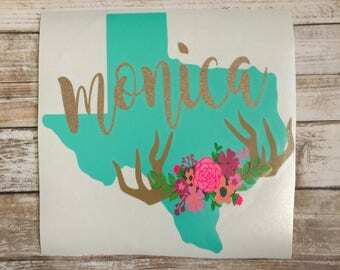 If no colors are selected, your item will be as shown in the main photo (Mint state, glitter gold name). Kentucky, Massachusetts, Montana, Nebraska, New York, North Carolina, Tennessee, Virginia. - Outdoor professional grade vinyl (7 years outdoor use). 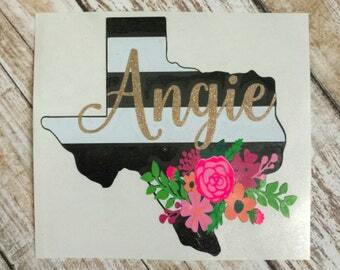 - Layered decal consisting of 9 colors. - Vinyl is removable, but not reusable. - Can be applied to any hard, smooth, non-porouse surfaces. - Application instructions, applicator, and alcohol wipe are included with your item. 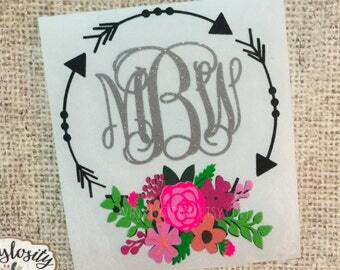 - This decal is NOT for the wall or clothing. Decal on a vehicle: do not wipe with harsh chemicals and do not scrub. Production time for this item is located in the listing photos. 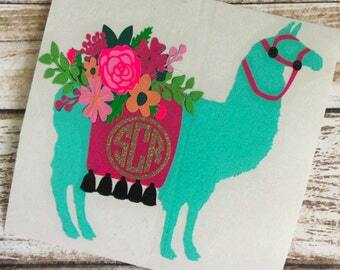 Decals are mailed using USPS First Class Mail and should arrive within 2-5 days of shipment. 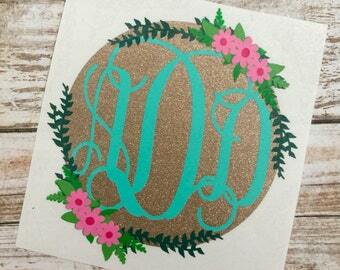 Free shipping when you purchase 3 decals. I’m in LOVE. so many compliments on it already, and asking where I got mine. I accept all major credit cards and payments made through PayPal. You item will NOT be started until payment is made in full. If your product ARRIVES damaged, I will replace your item upon receiving a photo of the damaged item. Please contact me within 48 hours of delivery of the item. Please do not throw the item away before speaking to me as I may request the item back. Non-custom items are eligible for return, at customer's expense. 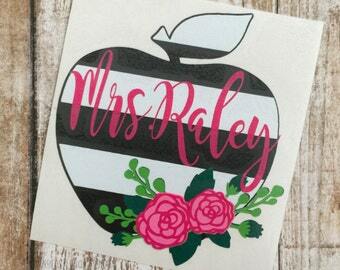 Production time for decals and mousepads is up to 7 business days from placing your order. Items will be shipped using USPS First Class and should arrive within 2-5 days after shipping. Production time for pet tags is currently up to 2 full weeks from placing your order. Tags are shipped using USPS First Class and should arrive within 2-5 days after shipping. Allow 24-48 business hours for your tracking to update. Often times, USPS website will update the tracking much quicker than it will update through Etsy. During the holidays delays are common so please plan accordingly. Double check that your address is given correctly during checkout. Message me as soon as possible if your address needs to be changed. If your item ships to an incorrect address and it is not returned, you will have to purchase the item and shipping again. If the item is returned, you will be responsible for paying to ship the item again. Please contact USPS for an updated delivery date. Check that the correct address was provided during checkout. If so, call your post office for GPS coordinates of the delivery and check with your neighbors. If you are still unable to locate it and your post office was unable to locate it, you can then file a police report for stolen mail. If you still want the product, you will have to purchase again as first class mail is not insured. Please be sure and read the item description carefully on each listing. There you will find product information, ordering instructions, production time, and shipping information. 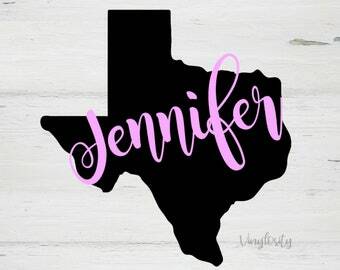 If you do not leave your personalization options in the 'Note to VinylosityCo' comment section at checkout or message me with your options, I will attempt to contact you via Etsy message. If I do not receive a response by the time your order is due to ship, I will refund and cancel your order. If you have additional questions, please feel free to message me! I'm happy to help! 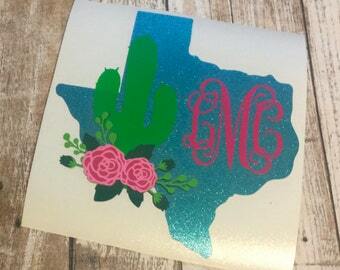 What size decal do you recommend for a _______________? YETI Colsters or equivelant: 3"
20oz Tumber, Water Bottles, Ect. 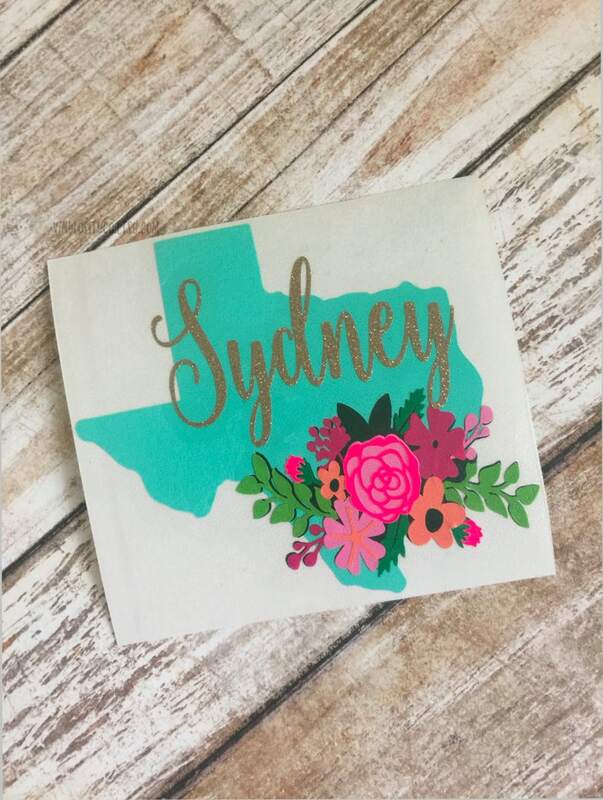 - 3.5"
I would encourage you to measure the area that you will be applying the decal to in order to find the perfect size for your needs! My production time varies from item to item. To have a more specific production time, please check the item listing details. 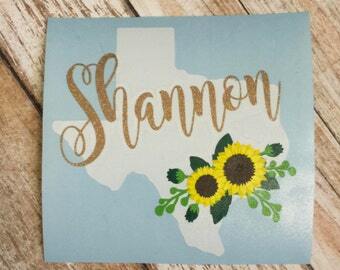 Where do I add personalization details? You'll just need to add this in the "Note to VinylosityCo" comment section during the check out process. If you forget to do so, send me a message with the details! Yes! Send me a message with what you are looking for and I will do my best to accommodate.